Princess and heir to the throne of Thorvaldor, Nalia has led a privileged life at court. But everything changes when she learns, just after her sixteenth birthday, that she is a false princess, a stand-in for the real Nalia, who has been hidden away for her protection. Cast out with little more than the clothes on her back, the girl now called Sinda must leave behind the city, her best friend, Kiernan, and the only life she's ever known. Sent to live with her only surviving relative—a cold, scornful woman with little patience for her newfound niece—Sinda proves inept at even the simplest tasks. Then she discovers that magic runs through her veins—long-suppressed, dangerous magic that she must learn to control—and she realizes that she will never learn to be just a simple village girl. Sinda returns to the city to seek answers. Instead, she rediscovers the boy who refused to forsake her, and uncovers a secret that could change the course of Thorvaldor's history forever. 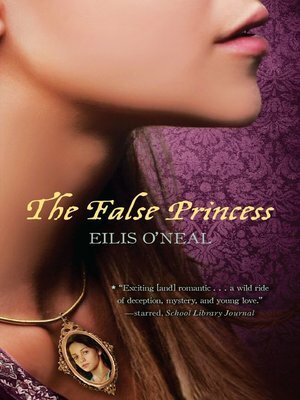 An intricately plotted and completely satisfying adventure, The False Princess is both an engaging tale in the tradition of great fantasy novels and a story never before told that will enchant—and surprise—its readers.